You may only need to get the regulation 3 kit to satisfy the OHSact minimum requirements, however it is short on some very useful equipment: Burn dressings, Notepad, Pencil, Shock blankets and Spare gloves. As such we recommend you get the recommended kit as it contains these items and several more to make dealing with an emergency much easier, and much more effective. 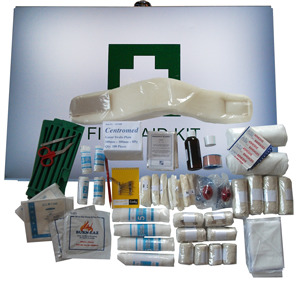 The recommended kit also comes with a printed sign to satisfy the signage requirements for first aid kits as well as spare equipment of the most used items so you don't need to restock your kit as often.